The Health and Social Care Act 2012 made significant changes to the NHS and required the Local Authority to form a Health and Wellbeing Board to deliver improvements to the health and wellbeing of the local population. The Board includes the County and District Councils, GP’s from Clinical Commissioning Groups, HealthWatch, the National Commissioning Board and representation from service users, carers and older people and they must work together to develop a Joint Health and Wellbeing Strategy (JHWS). The strategy explains the health and wellbeing priorities the Health and Wellbeing Board has set in order to tackle the needs identified in the Joint Strategic Needs Assessment (JSNA). The strategy is not about taking on everything at once, but about setting priorities for joint action and making a real impact on people’s lives, particularly in relation to promoting health equity therefore reducing health inequalities. 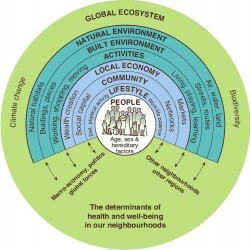 There are a wide range of factors that influence people’s health and wellbeing, ranging from lifestyle choices such as smoking and physical activity to social determinants like education, housing, employment, and crime as well as environmental factors such as the house we live in, the roads we have to cross and whether we have access to public transport (see Figure 1). In Devon there are health inequalities and vulnerable individuals, groups and communities that may need more help and support. To achieve this it is important to think of health and wellbeing in its widest sense and the health map below shows that the health and wellbeing of the individual is important but this is influenced by many other factors. To be effective action needs to be at a local level and this can only happen by empowering individuals and local communities to take responsibility and influence these areas when they can with the right support and care when needed. In line with national requirements individual commissioning organisations will need to set out how their own annual plans will deliver the Joint Health and Wellbeing Strategy priorities.